Links to product pages at Hankyu Books, Amazon Japan, etc. Mainly black and white, but full of large photos of stars of the 70s, as well as many photographs going back to the very beginnings of the revue. 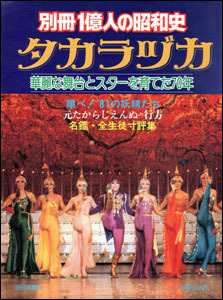 It also includes essays, information, and small blurbs from or about many of the older stars of the revue. At the very end is a mini-Otome-like section with photos of all of the current (1981) members of the revue. 256 pgs. Created by caithion. Last Modification: Sunday 27 of April, 2008 07:02:36 PDT by caithion.